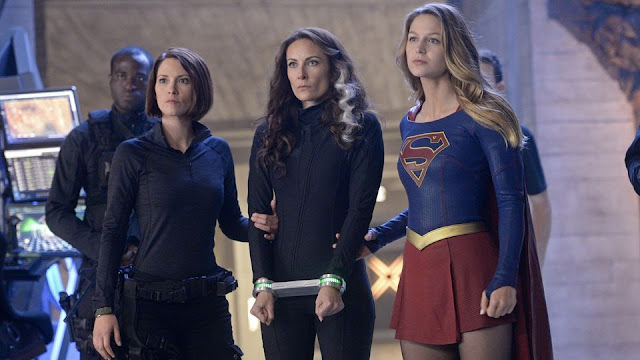 REVIEW: Supergirl (S1E9) "Blood Bonds"
'Supergirl' returns for its midseason premiere with more of a shuffling of the deck than breaking new ground. It's one of the nagging problems with the series that wants to have it both ways - high-flying comic book adventure while mired in the minutia that keeps it grounded. 'Blood Bonds' takes us back instead of propelling the story forward. When we last saw Kara she was battling Non at Lord Technologies and that's where the episode picks up. The aftermath leaves Maxwell Lord peeved enough to scowl at Alex and call Supergirl a "pet alien" putting a damper on any further flirtations for the moment. Later we find that Lord is doing some kind of experiments on a young woman. Could he be trying to create his own Supergirl? We'll have to wait and see. Kara and Cat have had this awkward working relationship with a tough love mentorship. The attempts by Cat to have Kara admit she's Supergirl were amusing enough but seemed like a lot to commit to in one episode. There's already three other storylines to juggle and having Kara quit to avoid revealing her identity only to have Hank morph into Supergirl to prove she's not her and get her job back could have been drawn out in a couple of episodes. However, there always comes a heartfelt discussion between Kara and Cat that pays off with genuine emotion after some sort of conflict. As usual, Melissa Benoist shines in her performance exposing her emotional range when she confides in Cat that she makes her stronger by working with and for her. She chose to lead this double life because working at CatCo allows her to feel human while her duties with the DEO give her the opportunity to do some good in the world. Having Winn and James in her corner brings some normalcy to her otherwise extraordinary life. She could work for the DEO full time and not have to deal with Cat altogether but she believes she can grow more as a person at CatCo. Kara's self-exploration is an important aspect of 'Supergirl' in that she's able to show dimensions to her character. Unfortunately, the same can't be said about her Aunt Astra. Her mission is as muddy as it's ever been even with the flashbacks. Her motivations on Krypton and on Earth are unclear although her terrorism was for ecological reasons. Reasons that Alura also believed in but Astra isn't so forthcoming about what this supposed "war" is all about. Laura Benanti deserves some better more decisive dialogue that makes her motivations clearer. Just when you think Alex is going to emerge from Kara's shadow and allowed to lead at the DEO here comes Grumpy McGrump General Lane again overseeing the rescue of Hank from the grasp of Non and the Kryptonians. For a moment though Alex takes the lead and is afforded some time to shine. Yet its Kara that comes through with information from her aunt without using torture tactics that Lane would use. This, unfortunately, relegates Alex to sidekick status once again. The scenes at the DEO still aren't as fleshed out as at CatCo. With Hank's reveal that he's the Martian Manhunter the anticipation was things would get more interesting. At least more than for playing a trick on Cat. Alex is still underdeveloped and underused to great effect. The sisterhood still needs some more bonding. It seems there's been more of that going on between Kara and Cat instead. Still, 'Supergirl' continues to find enough moments that elevate the episode beyond what it should. With Astra released, Hank back safe, Kara still at CatCo and Lord up to no good it seems like we're back to where we started before the break.